For those of you who were disappointed to find the blogging series didn’t continue last weekend, my apologies! That week totally got away from me and then I was off to Hawaii, and didn’t want to spend my time on vacation on my computer. So here I am, one week later, back with the blogging miniseries! This section is dedicated to monetization and brand partnerships. For those of you who are newbies or unfamiliar with how blogs work, I use (as do 99% of all fashion/lifestyle bloggers) an affiliate network as a means to earn money through my content, both on the blog and all of my social channels. An affiliate network provides me a unique login where I can search for products and grab trackable links to pieces I want to feature on my site. These links feature my unique code, so the affiliate network can track purchase behavior on a retailer’s website (Nordstrom, for example). If you go to any of my outfit posts and scroll down to the “Shop The Post” section, most of these links are affiliate links. That way if a reader clicks through one of those links and then makes a purchase because of my suggestion, I will be rewarded with a commission (a small cut of the sale). This does not effect a reader’s purchase or keep any of their information – it’s simply Nordstrom rewarding me for sending my reader their way. What’s great about affiliate links is how you can incorporate them in such an organic way. For example, my weekly series THE EDIT, features products I’m obsessed with each week. It’s never sponsored, but it’s always an organic roundup of things I like. When I use my rewardStyle links, I can still be rewarded for any sales I do send a retailer’s way, without any blatant advertising happening. There are two types of affiliate networks: pay-per-acquisition (rewardStyle) and pay-per-click (ShopStyle). I’m a rewardStyle blogger all the way, and that’s not just because I used to work there. The pay-per-acquisition method is the best option for me and my readers, simply because I don’t have a massive amount of click-throughs on all my links every single day, but those people who are clicking through are buying (and buying a lot). If you have a loyal and engaged readership, rewardStyle is the way to go. However, if you get a huge amount of clicks but not as many conversions (or a lower than average cart price), a pay-per-click method might be your best bet. I have blogger friends who are very successful on both platforms, so it really just depends on what your audience is doing! If you are unsure, I’d recommend testing both methods out and see what works for you. I would not recommend using both a pay-per-click and a pay-per-acquisition method at the same time though, because you’ll just be cannabilizing your own links (the ShopStyle links will basically just be disabling/cancelling out the rewardStyle links, and vice versa – only one network can capture a sale). Even though you’re getting paid per clicks with ShopStyle, ShopStyle is actually raking in the commission money you would have gotten if you had used rewardStyle. LikeToKnow.It – if you have a powerful Instagram influence, you need this app. It’s rewardStyle’s Instagram monetization tool, that allows you to link your exact outfit details and have readers shop your Instagram photos directly from their email inbox. ShopStyle attempted to create a similar tool (anyone remember that?!) and it didn’t work, so they don’t have a way to capture that audience – most of the bloggers you see using ShopStyle on their blogs still use rewardStyle for LikeToKnow.It on Instagram. The Tools – rewardStyle was launched for the sole purpose of monetizing fashion blogs and online publications, which means all of the customer service, strategy, and tools are all geared toward the fashion/lifestyle blogging community. The website is incredibly easy to use, all the widgets are clean and blend in with your current site’s aesthetics, and it doesn’t feature any kind of branded pop-up when you are linking to a product or website. ShopStyle on the other hand is just one of many brands under the PopSugar umbrella – you know, the entertainment news site? Events: in addition to the rewardStyle conference held annually, rewardStyle hosts a variety of educational and social events throughout the year in various locations worldwide. These events provide a unique opportunity to network with likeminded bloggers, brands you aspire to work with, and also learn ways to improve your blog + content that will lead to more conversions and better performance on the platform. Clearly I’m biased, but I think it all totally depends on your audience and how they are engaging with your content. It’s worth testing out both platforms to see what works best for you – what works for me may not work for you! If you are at a place where you are ready to monetize your own blog or Instagram, click here to apply to become a rewardStyle publisher. I highly recommend waiting until you have six or so consecutive months of good content (both on your site and social channels) before applying – ideally, you should be posting 3-5 times per week. rewardStyle is an invitation-only platform, and they only accept a very small percentage of applications – they want to make sure they are investing their time and resources into bloggers who are going to stick with it and not give up after a few months. Another thing to note: if you get rejected, you must wait a full six months before applying for a second time – so be patient! In addition to affiliate links, bloggers can also feature banner ads on their website. You often see these on the sidebar, in between blog posts, etc. These ads can be pay-per-click, pay-per-acquisition OR pay-per-impression (meaning the number of people who have visited your site and seen the actual banner ad). Generally banner ads are the most effective in earning money when you have a large number of pageviews on your blog/website. Brands will offer a certain percentage or dollar amount per number of impressions, and it all depends on people going to your website. I personally do not rely on banner ads as a means of income, but more for making my sidebar look pretty. Last but not least, let’s talk brand partnerships and collaborations. There are really two main ways to partner with brands, featuring a bunch of sub-projects under each umbrella. As I mentioned in the first post of this series, gifting should never be expected, especially as a new blogger. The more your following grows and your readers get more engaged, you’ll have more negotiating power, but don’t ever start a conversation with a brand asking for gifted product if you’ve never been in contact with them before. Brands will likely be interested in gifting product to you at some point, but not just because you’re a blogger. If you have specific brands you dream about partnering with in the future, start including pieces by those brands/designers in your blog and social content. I always find it hilarious when bloggers get mad about not receiving an invite to a show at fashion week, when they’ve never once talked about or featured any of the designers hosting the shows on their own sites. Why should they invite you? You’ve showed no interest in their brand until now. This is the same for gifting – why should they gift you if you’ve never posted about their brand before? Is the brand actually in line with your current content? If you only talk about budget-friendly brands, don’t expect to receive a gift or partnership opportunity from a luxury designer. Decide your price range and audience early on, because brands will look at your past content to make sure it’s a good fit. When I first started getting emails about free/gifted product several years ago, I was psyched! I accepted a lot of the stuff, because why not? But as my blog has matured and I’ve honed my niche and grown my audience, I no longer accept gifted product in exchange for promotion. In order for a brand to get a dedicated feature on my site or social channels, I require them to pay me a flat fee. Unless it’s a brand I’m dying to work with, it’s a hard and fast rule I’ve stuck to – this means I get hundreds of emails offering gifted product that I have to turn down. Leading to my next point – you’ve got to learn to say NO. In order to stay true to your brand and maintain an organic feel on your site, you cannot accept every gifted piece that comes your way – your readers will notice. Try to only accept product that fits with your aesthetic and is something you would actually choose to wear on your own. If and when you do start receiving gifted product, the FTC requires you to disclose that in your posts. I myself use “c/o” which stands for “courtesy of” in front of any gifted product I receive and feature on my blog. Other bloggers use something similar like “thanks to” or “gifted”. Just because something has been gifted, doesn’t mean the post is sponsored – read on for how I disclose sponsored projects. Regardless, you need to be consistent with it. Now onto flat fee projects! I didn’t start participating in flat-fee collaborations until about two years into having my blog. In the beginning the rate was very low. I think I charged $200 for my first big project? As my blog and audience has grown, I’ve been able to raise my rates. It wasn’t until last year that I really started making substantial amounts via collaborations. It takes tiiiime. As I keep saying, don’t expect immediate success – it just doesn’t happen! Back to what I was saying above about only choosing gifted products that meet your aesthetic, the same goes for brand collaborations. The brands I work with most are ones I’ve talked about and loved for years: Nordstrom, Tory Burch, Diptyque, Tibi, La Mer, etc. Every once in awhile there’s an occasional brand I partner with that I believe is on brand and totally meets my aesthetic, but I either hadn’t heard of them before or hadn’t had a chance to try the brand out until now. For example, I’ve owned UGG boots for years – I purchased some boots + sneakers organically while I was abroad this fall, and then a month later got an email from rewardStyle about a partnership opportunity with them. It was great because I already owned the boots! It was an easy sell. On the other side of that, UGG approached me again early this spring to promote their brightly colored shearling boots, and I had to turn that down. I just couldn’t see myself wearing UGG boots in bright pink or blue – it wasn’t my style. So I turned it down, and then they ended up coming back with a different proposal featuring more stylish leather boots that I felt way more on brand with. Success! In addition to sponsored blog posts and Instagram pictures, I also host events for brands at their local Dallas, Austin and Houston stores. I charge a flat fee for these partnerships, and generally get some gifted product or a free outfit out of it as well. It’s way for the brand to spread awareness about the store, new collection or special event/sale happening at that moment. Whenever I partner with a brand on a paid collaboration, I always note that in my blog posts and social media posts. In those blog posts, you’ll see I feature a line that says “Thanks to Nordstrom for sponsoring this post!” right above the “Shop The Post” section, and on Instagram it usually says #Ad or #Spon. Sometimes a brand even has their own hashtag, like #ExpressPartner or #DovePartner, for example. Regardless of how you phrase it, it just needs to be somewhere obvious in your content if you’re getting paid for it – another FTC guideline. HOW DO I ESTABLISH BRAND RELATIONSHIPS? As I noted above, it’s important to feature those brands you want to partner with in your existing content. That way, if you reach out to them about a potential opportunity, you can send them a few links to give them context of how you’ve featured them before and love their brand. Every once in awhile I’ll come up with an idea and pitch it to a brand, but 98% of the time the brand or rewardStyle is the one reaching out and presenting a project idea to me. They usually have a campaign already figured out with a good idea of what they want you to create, but 9 times out of 10 you get complete creative freedom with the content. That 1 out of 10 is reserved for brands who are very, very careful with their brand image and need every piece of content approved. For those of you on rewardStyle or ShopStyle and perform well with affiliates, you will likely get projects – rewardStyle chooses bloggers for collaborations based on performance, so if you’re not making any money on the platform, don’t expect to have collaborations land in your lap. 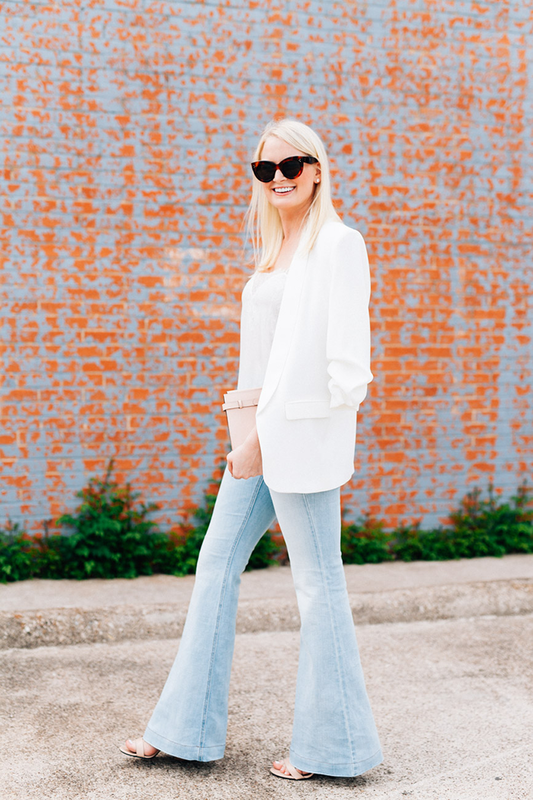 Most brands are looking for ROI when working with bloggers (in addition to exposure and brand awareness), which is why working through rewardStyle on projects is so great – the brands can see your performance from the posts they paid you for! The better you perform, the more collaborations you will get. It’s simple. Not all brands work through affiliate networks to partner with bloggers on collaborations though – many look to your social following and engagement as a means to selecting their partners. It really just depends on the brand! Engage on brand social channels – start conversations, like photos, comment, etc. It never hurts to email brands, even if you’re new. Start a conversation with someone on the brand’s PR or Marketing team, and keep up with those people. You never know where they’ll be in a year when you’re more established! If you’re on rewardStyle, reach out to your Account Manager and tell them which brands you are most interested in working with, and find out if they have any tips on how to increase the possibility of a collaboration. Go to events! Brands like Neiman Marcus and Nordstrom host events and designer personal appearances constantly, so if a brand you love is having a trunk show, GO! You never know who from their team will be there – if anything, you’ll meet more people from the Neiman Marcus or Nordstrom team. Networking is key! I hope this post wasn’t too much jibber jabber! I may have gone off on a few tangents, but there’s a TON of information out there – I tried to cram it all into this one post for you to come back to! Click here to check out the rest of the posts in this miniseries. If you have any other questions about blogging, please email them to me by next week! My final post on this series will be next Saturday, and it will feature YOUR questions! Thanks for your tips and for your honesty. Thanks for posting this! I have no intention to become a blogger, but have always been curious about the logistics. And thank you for being so honest! I find some bloggers to be very hush-hush about their careers, so appreciate this. Your blogging mini-series has been the most valuable source of information about blogging and how to blog as a career I have ever come across. Thank you so much for sharing your experiences and tips. So inspiring and I appreciate the candidness of your post! Fashion is great and all, but it’s so nice to learn more about behind-the-scenes type stuff, which is why I love this series and your blog!! Keep up the amazing work!! Great stuff! Thanks for the tips! So much incredibly valuable information packed into this one article! I am loving this series because there are so many things about blogging that no one talks about! It’s always amazing when successful bloggers share their knowledge and what works for them. I really appreciate your info in this post! What s wonderful post thank you so much for sharing this wealth of knowledge! I loved this post, so many of these are so true! Thanks for sharing your insight and advice. I use ShopStyle mostly because my readers click more than they buy. But, for items on sale that I’m sure will translate into sales, I use Amazon affiliates and Linkshare (which are also commission based). I do get clicks through my Shopstyle tool on Instagram but the bulk of my social media clicks are through Twitter and especially through Pinterest. Rewarstyle seems to be very exclusive. I’ve applied twice and have been turned down. So, instead of becoming discouraged, I’ve worked my way around it and so far, so good! I also make money from writing content on a weekly basis for an affiliate marketing company called Splender. Freelance writing is another great way to monetize your blog and drive more traffic and followers. Gorgeous photo and GREAT tips!! This is a fantastic post. I’m pretty new to the whole blogging thing, and this is really helpful! Thank you!